Sold at Christies in 1996. “This collection contains remarkable material of a scope and quality never seen before in public. Only by re-visiting Binns Road in its heyday from 1938 to 1964 would it be possible to imagine seeing such a collection again. Starting in 1970, Anthony Bianco set himself the target of producing a definitive collection as part of the research for Michael Foster’s master work, ‘The Hornby-Dublo Story 1938-1964’. To achieve this, literally many thousands of items passed through his hands, until his rigorous standards of quality and condition were satisfied. Substantially complete by the early 1980’s, his prodigious knowledge continued to grow, and further rarities were added to the collection, not to mention the superb Hornby AcHO collection, a quality rarely seen in this country. Since the original formation of the collection, no items from the collection have been sold." Some of the items not sold in 1996 - now being released..
"It was twenty-six years ago now that the author of the Hornby-Dublo Story, Michael Foster, responded to an advertisement by Anthony Capo-Bianco for Dublo trains. A friendship developed. 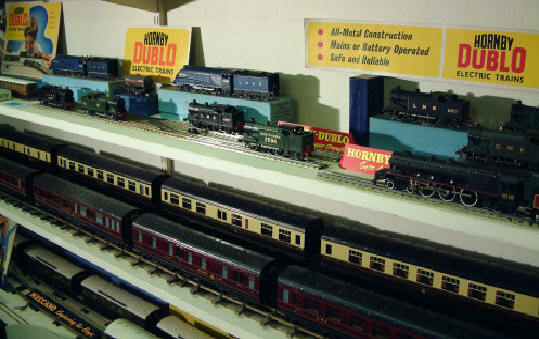 One of our aims was to jointly catalogue the variations and entire production of the Hornby-Dublo range of model railways, then to publish the results. The Meccano empire as such had grounded a few years earlier in 1964. Models were really quite inexpensive then – Barnstaples and Dorchesters at 30/- each (only £1.50) for example. As models came into focus, the smaller production runs became harder to find. Prices escalated due to demand – the fever of collecting had begun. Fellow enthusiasts joined the team: John Callow, John Marr and Alan Ellis. The task took eight years to complete – and a further two years to publish the resulting book. April 1980 saw the launch by New Cavendish Books of the Hornby-Dublo Story as No.3 in the ever successful Hornby Companion Series. Today, sixteen years after production, sees the books still selling – 50,000 copies to date. The Railway Book Club states it has been their most successful book ever, with reviews saying that it set new standards in presentation and content. From this start back in 1970, Anthony Capo-Bianco has been constantly adding to his collection, improving the quality and range. It is regarded as the most comprehensive ever known, and accepted as perhaps the finest in quality and condition. Virtually all of this then is the collection now to be sold – the boxed sets, the individual boxed locomotives, coaches, rolling stock, accessories, buildings, signals and spares. To complete your collection and find that elusive item, or start from scratch – here is your opportunity. For accuracy, for play value, for reliability – the Hornby-Dublo range of model railways, covering the final years of steam, will come to be regarded as perhaps the greatest range produced in the 20th century – a fitting souvenir of a day and age of quality now gone". 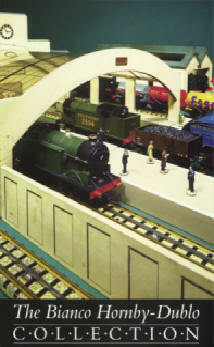 Many of the models in this sale were used to create the photographs used in the Hornby-Dublo book.